ANS offers this award for the best clinical or basic science paper in Neurotology submitted by a Resident or Fellow in training in the field of Otolaryngology - Head and Neck Surgery. Residents from any approved residency program or Fellows in Neurotology in the United States or Canada are eligible to compete. Authorship: The Resident or Fellow must be the primary author. He or she must provide the main inspiration for the paper and do the literature search, data collection, original and final drafts of the article, the discussion, and the conclusions. A staff sponsor may be listed as co-author or second author. The sponsor or staff consultant may only provide editorial help, cases for study, and/or a research laboratory setting for carrying out bench research. The Paper: The paper must be an original contribution, not previously published. A clinical study or basic research study is acceptable. Single-case reports or literature reviews are not acceptable. 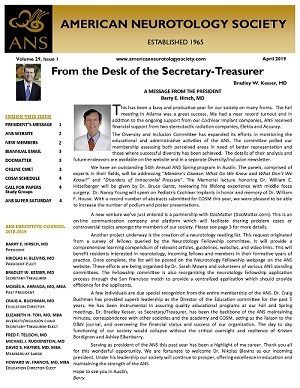 The paper must be presented in the publication format recommended by Otology & Neurotology, the official journal of the ANS a minimum of 4 weeks before meeting. The author must submit an electronic copy of the manuscript, including illustrations. The name of the author and any other identifying information should appear on the cover sheet only. The Prize: ANS has established a cash award of $1,000 for the winning paper. The author will be expected to attend the Annual ANS Spring Meeting and present the paper in person.